Also read soudou. Twin buildings in the grounds of a Japanese temple that are of equal length, but not necessarily of equal depth, arranged one in front of the other. During the late 7c to late 12c, there was open space between the two parallel structures. The building in front was called *raidou 礼堂 and was used by the worshippers. The rear building contained the sanctuary *naijin 内陣, and could only be entered by Buddhist priests. The rear eaves *noki 軒 of the front hall and the front eaves of the rear hall behind were of equal height and close enough to install a wooden gutter to carry off the rain. During the 12c, with the invention of a hidden roof support system, one large roof could be erected over what had been two separate halls. Houryuuji *Jikidou 法隆寺食堂 (ca. 8c) and *Hosodono 細殿 (ca. 1269) are a rare example of a true narabidou. 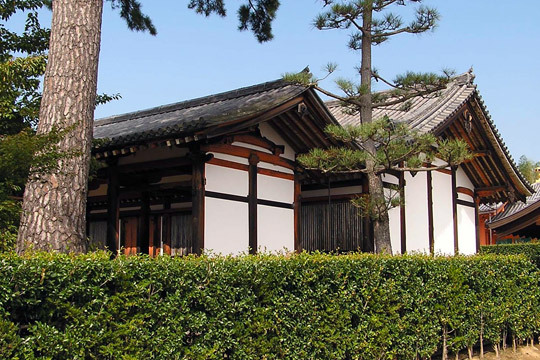 Both buildings have gable roofs *kirizuma-zukuri 切妻造, and are entirely separate.